Riley absolutely HATES having her temperature taken. Currently, we have one of those ear thermometers, which requires sticking a probe down into the ear canal. She constantly squirms and cries and it is next to impossible to get an accurate reading. I can understand though. If you're sick and don't feel well, the last thing you want is someone holding you down trying to pry some weird device into your ear! Sanomedics designed a talking, non-contact thermometer, so that you won't even have to touch your child in order to get a quick, accurate temperature reading. Now this I had to see! 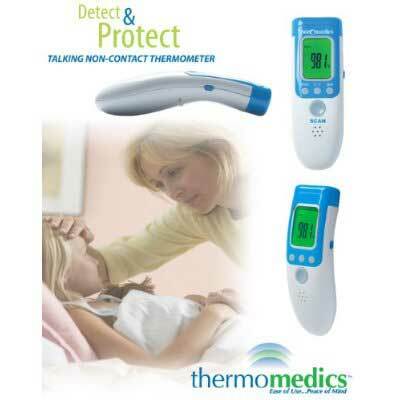 I reviewed the Talking Non-Contact Thermometer from Sanomedics, which retails for $34.99 with FREE SHIPPING. The touchfree thermometer by Sanomedics provides you with a non-invasive way to take your child's temperature, which is especially useful while they are sleeping. After installing the 2 "AAA" batteries (INCLUDED), simply aim the unit's sensor toward the forehead, two inches from the skin, and press the button. In ONE second, the temperature reading is displayed on the large backlit LED display. The Talking Non-Contact Thermometer has a talking feature in 3 languages (English, Spanish and French) too but can also be put on quiet mode so as not to disturb or awaken anyone. It even offers a memory of the past 32 readings so that you can monitor your child's symptoms easier. The thermometer's touchfree technology also allows you to check much more than a person's temperature. The Sanomedics Talking Non-Contact Thermometer can be used to check the temperature of a bottle, food, air or even bath water, making it easily one of the most versatile thermometers I've ever seen. How Does It Work? All living matter releases energy via radiation. The strength depends on the temperature. The Talking Non-Contact Thermometer by Sanomedics uses cutting-edge technology to measure the temperature of a person based on the energy that person is releasing. I couldn't believe how quick and easy it is to take Riley's temperature now, thanks to the Sanomedics touchless thermometer. She eyed me with suspicion when I came close to her saying that I was going to take her temperature and she was completely stunned when I never touched her, yet told her I was done. I love how now I can silently check on her in the middle of the night when she isn't feeling well to make sure that her fever hasn't spiked to a dangerously high level. 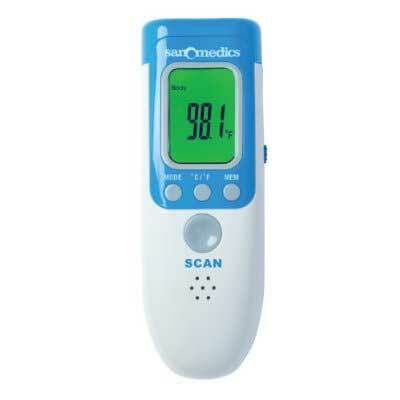 Disclosure: I received the Talking Non-Contact Thermometer from Sanomedics in order to facilitate my review. No other compensation was received. This product review is based on my own personal experiences with this item and is completely honest and objective.